Istanbul Turkey is located directly above Iraq where ancient Sumeria was and right above Egypt. The biggest alien hot spot in the world. This is where a night watchmen named Yalcin Yalman started seeing strange lights in the sky above the water while he was working, and decided to bring his video camera to work to get it all on tape. The anomaly didn't just happen one night, It's happened for many nights within the last few years. The footage that he captured was between May and October of 2008. The video that your going to see is broken up into two parts and is a compilation of the different nights he saw these UFO's. Yalcin was not the only one to see it, dozens of residents have all seen it as well. 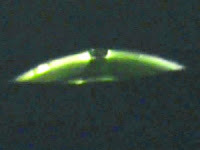 When UFO video's like this come to surface, the first place it goes is to a place like Sirius UFO Space and Research center. It's their job to debunk UFO hoaxes. After a ten day study, they came to the conclusion that this video is the real thing. No camera tricks or any kind of video manipulation what so ever, it's just a regular guy and his camera. There was a formal announcement was made on January 17, 2009 where most of the world was informed, except for the United States of-course. On a side note, out of every major UFO sighting that's happened in the world, we are the only major country that withholds the information from it's people. Anyway this video has been scrutinized and ridiculed as a hoax and that it's all computer animation. Further investigations by TUBITAK who is a board of Professors that are in the study of science and technology research, reveled in their official report: "The objects sighted in the aforementioned footage have a structure that is made of specific material are definitely not made up by any kind of computer animation nor are they any form of special effects used for simulation in a studio or for a video effect therefore in conclusion it was decided that the sightings were neither a mock up or hoax." It also concluded the objects do not belong to any other known structures such as man operated flying machines, planets, comets, meteors, and with no hesitation fall into the Unidentified Flying Objects category. Here is an explanation by one of the scientist who analyzed the footage. I now present to all my friends who believe and want to believe the most detailed and incredible footage of a single UFO that the world had ever seen. If you listen to the people talking in the back ground, you can hear that the expressions in their voices are genuine. Here's part one. And here is part two. Incredible! The time has come for the truth to be known world wide, it's time to end the secrets. I'm so ashamed to live in a country that hides the truth from it's people. I try to give humans the benefit of a doubt, but it's hard when our government withholds information on the m ost important issue of all time. This is going change history as we know it. Many of the life long questions will be answered and the truth about religion will be reviled. It's time to stop living in a world were everyone believes that their belief is the right one, it seems to always lead to fear and war, two things we as a species can live without. It's time to put these ancient beliefs to rest and move on to the next level of contentiousness. Let science and facts determine the truth. We need to stop living in the dark ages, pull our heads out of the ground and acknowledge what is real and what's not. The truth is obviously showing it's self to us and now it's time to acknowledge the truth that we are not alone. Except what is REAL, except the thoughts that you were tolled could not be true, open yourself to not only what could be, but what is. Do you really need the US government to officially make a statement before you believe it? Why do they do their best to keep questions about UFO's covered. How come it's wasn't on the news here like it was around the rest of the world? What? Americans don't want to know? We don't care?? Are you kidding?? If that was on the news you know as well as I do, everybody would be glued to CNN or FOX. Their ratings would jump sky high. Now you must ask yourself, don't they want high ratings? Why wouldn't they show life changing news? The answer is, of course they want people to tune in. But these news affiliates tell only what they want you to know. It's important to remember that these stations are run by the aliens, they are the one's in power. They will do anything to cover up their existence. This is why most American's believe this to be nonsense. It's Hollywood and television conditioning your mind so you say to yourself there is no way this can be true, that it must be make believe. To my American friends, the rest of the would thinks differently. We are sheltered from the rest of the world and are made to think we are gods gift to the earth. Open your mind and let your thoughts be open to REAL truth. "IN GOD WE TRUST" is instilled in your mind if you live in the states. It's on our money, in our pledge, we are "one nation under god". We are so willing to believe as an American society in a "God" who we will never see or hear, so much so that we our willing to live by his rules, and for some, their life is lived through god and he is the only one making the decisions for them. But yet, something that is right in front of our face's, see by millions from all over the world, in pictures and videos that keep popping up all the time, is written off by these same believers in god, as fiction. Why? Because belief is the most powerful driving force in ones life, and what you believe is what becomes real. Remember, it's ALL in YOUR head and nobody ells es. For me, what I can see, hear, smell, taste and touch is real, at least on this planet, while I'm awake anyway. To me, that's a good test if something is real or not. Our courts and judicial systems are also all base on evidence, not just by the words of somebody, but real tangible evidence. Don't you think this is how we should live our lives, and base our beliefs, knowing what's real and what's not, based on facts. I suppose if your able to live in different dimensions, or on different planet these rules of what's real may not apply. I mean, it's fun to dream and have a story to t ell your kid's when their fish dies, but it's 2009 and with all the evidence that's out there, it's time to change what we believe as a society. Either way it's all bassakwards and it's called brainwashing. They are trying to erase the mind that which is rightfully yours, and condition it in order to have brain's natural response to this UFO phenomenon be "This is nothing more then science-fiction" Think about it, and ask yourself "what do I really believe?" It's time to attain the mind that could be lost in an ocean of chaos we know as the mainstream media, if you don't allow yourself to open. The matrix will own you forever. Take the red pill, and attain the knowledge that will set you free from the madness, life will become clearer and less confusing for you, be open to the world and it will open on to you and you WILL attain your attainable mind.